I have been eyeing this gorgeous Mood Fabrics' Confetti Cotton-Blend Tweed for about three months and in March I just knew I really needed it for spring. My accumulation of fabric is going better than my making of garments lately but that is okay, I need some for a rainy day, right? After this fabric arrived at my doorstep, I had time to touch, feel and admire it. With such admiration, I needed to find a pattern. I used to always have the patterns first and then had trouble finding the right fabric. It is much easier to find the pattern after the fabric, at least for me. I say that but with this instance, I changed my mind at least twice. My first thought was Vogue 1440, which I ordered right after the release. The more I thought about it the more I didn't think fringe was me and decided to think about the pattern a bit more. 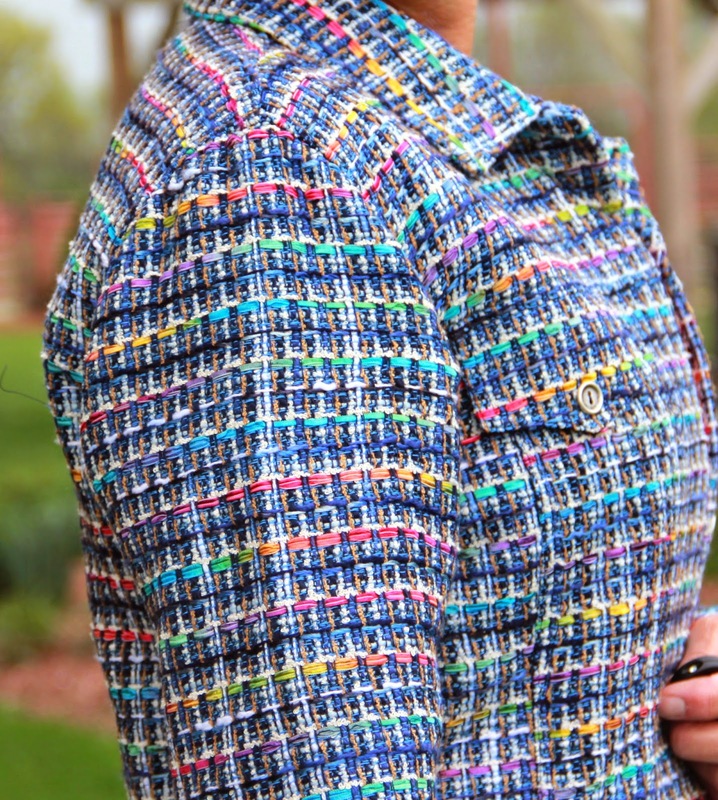 I went to several RTW sites and decided I like the look of a tweed jean jacket and used my Kwik Sew 2895 pattern. I did have some doubts on my decision and blogged with a cry for help. Many people said go with the jean jacket, so thanks for the confidence boost. With all the stripes, I cut each piece out in single layer. I did make one mistake on the front side piece and matched the subtle navy stripe to the bold stripe when cutting (you can see it in the above picture). I was a bit disappointed after I realized my mistake but those things sometimes happen, right? I am blaming a nice flu bug on that one (at least that is my story and I am sticking to it!) The tweed is a bit lightweight, so I fused my entire yardage with Fashion Sewing Supply Pro Weft Supreme Medium Interfacing (a perfect weight for underlining) , using Fashion Sewing Supply Pro Woven Crisp for the pattern pieces that called for interfacing. To help make the inside a bit prettier, I went with a navy lining but didn't do a traditional full lining. I layered the underlined tweed piece with the lining and treated the layers as one. A Hong Kong finish did come to mind but I went with a serged seam finish. On this jean jacket, the majority of seams are pressed one direction and then edgestitched and topstitched. The fabric was thick with the layers and I didn't want to add the finish treatment to the thickness. I am very pleased with the result and it works well in this instance. I did use the lining on the underside of the pocket flaps to help reduce bulk. The under collar was cut two pieces and on the bias. Now to sizing, I went with a medium in the shoulders and a small for the rest of the garment. Wanting a shorter jacket, like my RTW inspiration, I cut off 2" from the length but added 1" to the sleeves. After my initial fitting of the jacket, I did add some shaping to the sides seams, creating a bit of a curve in at the waist. I went with these silver buttons, the size recommended on the pattern envelope but not nearly as big as the inspiration jacket. I am very pleased with my jacket, it is my style and I love the fabric. It was fun to make a more traditional garment from an unexpected fabric. If this colorway isn't your style, Mood Fabrics' has many other tweed options . Any styling suggestions? Thank you so much, Patty. Very cute jacket. And I like the way you styled it. In fact, I like yours far better then the very expensive inspiration piece! Enjoy your new jacket! Thank you, Lisa, I didn't want a matchy look as their example. I think it will be fun to wear many different ways. Great Jacket! Awesome sewing job! I like the look of the tweed in this jean jacket. Thank you, Rose, isn't the tweed beautiful. Pretty jacket! When I first saw it I thought it was boucle. Thank you, Dorothy, it is striking fabric. Looks great and suits you well. Thanks, Vicki, it is more my style than the fringe for sure. I have made both versions of this pattern in the past. I keep seeing it pop up over and over again here recently. It is a great pattern for a jean jacket. I am truly impressed with the fabric you chose to make it. It really "classes up" the jacket. It has also given me an idea to use some similar fabric for this pattern.Great job! Thanks, Linda, the pattern is a classic. Have fun making another one. I really like this! I think that pattern is so versatile and with tiny tweaks, basically a classic. It looks great! Thanks so much, it is a great pattern. 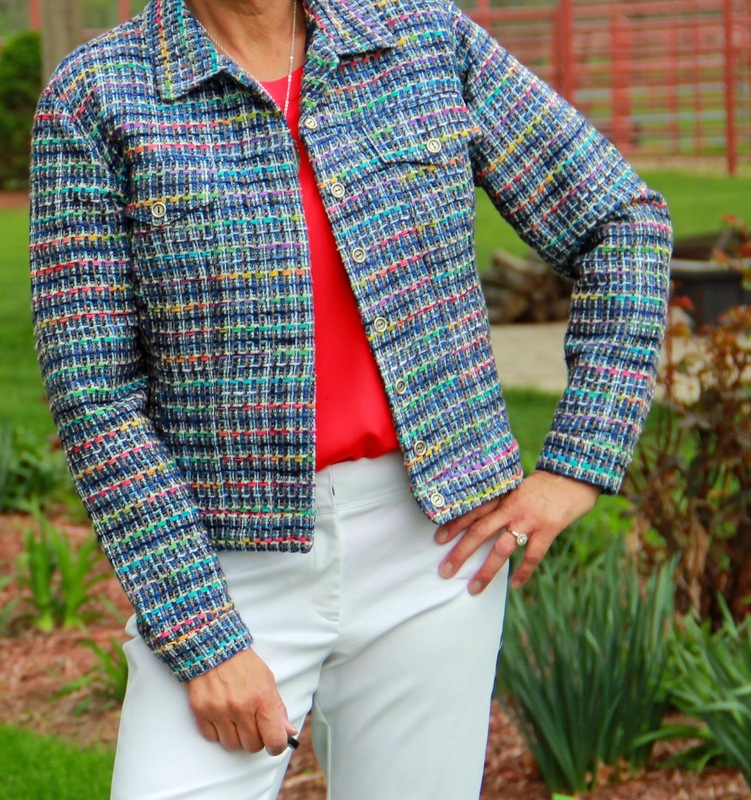 Such a fun jacket, Lori, so bright, and great for spring! I really do like it with the white slacks. I think it would look very nice with the jeans you recently made, and a white top underneath as well. Maybe with a denim or white denim skirt? Thanks, Andrea, I love the color, too and thanks so much for the styling idea. Lori, I just had to come back after visiting your inspiration piece to say holy smokes! Sticker shock! And have you considered making a skirt from the same fabric like your inspiration piece? LOL, pretty pricey, isn't it? I thought about it a bit but I rarely wear skirts so no I probably not. Lori you did an awesome job and it looks great paired with the red top and jeans. I was on a mini vacation so I'm just getting caught up on my reading - I love your jacket!! I have similar tweed that I was trying to decide which direction to go with too, I love your choice. Thanks so much, hope you had a great vacation.